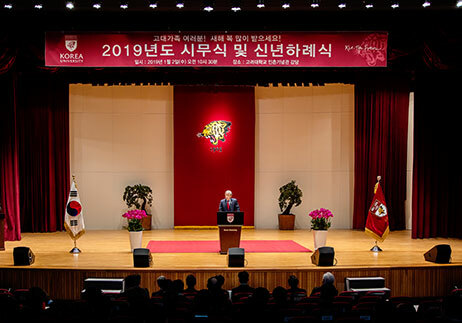 The Korea University Foundation held the inauguration ceremony of the 20th president of Korea University, Dr. JinTaek Chung, on February 28 (11am) at the Inchon Memorial Hall of KU. In his inaugural address, President Chung said, “Currently, the world is filled with such chaos and upheaval that it is difficult to foresee the future. In the era of the so-called Fourth Industrial Revolution, a huge wave is crashing down, uprooting the paradigms of politics, economy, society, culture, science, and technology. Korea University has always served as a guiding star of the historic world by trying to find balance in the chaos of the world and by suggesting a clear direction regardless of the uncertainty of the future, and now is the time for us to once again summon up the courage to build a better future.” He proposed a new model for KU, “A university that creates new value focusing on people —an institution that cultivates creative future talents and changes the world,” and wanted to share the plan to realize it. 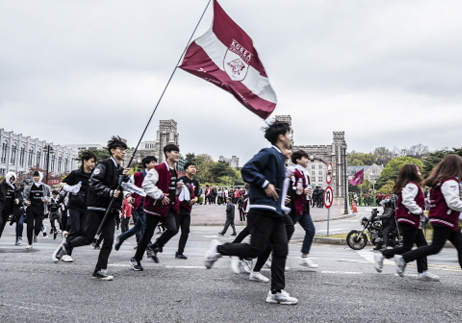 Second, President Chung said that he would open an era of integration and consilience. He continued, “KU will create new value in a super-connected society where divisiveness and choosing sides are avoided. Efforts will be made to create a diverse educational and solid research environment and practical research will be emphasized to satisfy the needs of society. Third, he showed a strong will to nurture moral human beings, stating that KU’s “public needs take precedence over private needs” mindset is the basis of the Korean version of noblesse oblige. He said, “Through social contribution education and experience programs, KU will try to make students feel the value of sharing and service. With the tremendous development of research and science/technology, we are living in a world where machines may threaten the well-being of human beings. Also, to prevent deviation from and to encourage ethical use of machines, the cultivation of moral talents is a very important task of humankind. Fourth, President Chung shared his plan to establish an ICT campus built on international standards to actively respond to social change. Vice chairman In Kim of the KU Alumni Association, who attended on behalf of Chairman HakSu Lee, said, “President Chung is the first president from the College of Engineering in KU’s 114-year-long history. This reflects KU members’ desire to recast KU into a future-oriented university that will play a leading role in the era of the Fourth Industrial Revolution. In response to such a summons, our new president promised to develop KU into a university that produces creative future talents and changes the world. He also promised to create a new KU culture in which members respect each other through “people-centered operation, open communication, and autonomous administration. 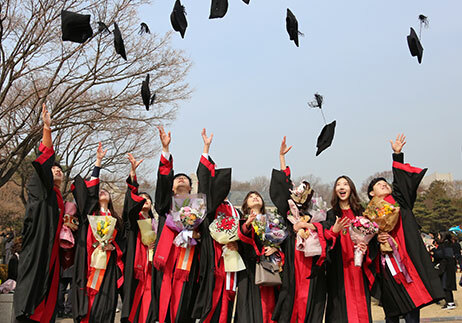 KU alumni hope that KU’s new president will display a new paradigm of college education on which KU students will grow into creative talents and be able to demonstrate their competence with the whole world as their stage in the future. 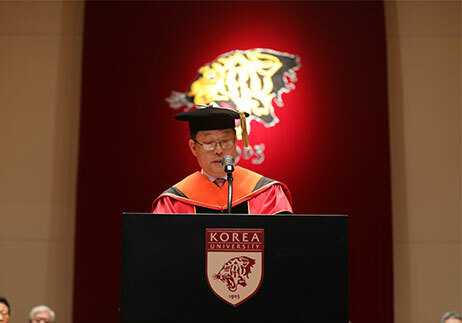 The inaugural ceremony was attended by JaeHo Kim (chairman of the Korea University Foundation), In Kim (vice chairman of the KU Alumni Association), IlSik Hong, JeongBae Kim, YoonDae Euh, PhilSang Lee, KiSu Lee, ByoungChul Kim, JaeHo Yeom (former KU presidents), WookHwan Cho (chairman of the Faculty Senate of KU), JinSeong Kim (president of the Cyber University of Korea), Syekyun Chung (former chairman of the National Assembly), and Yong Hoon Lee (chairman of the Inchon Memorial Foundation). 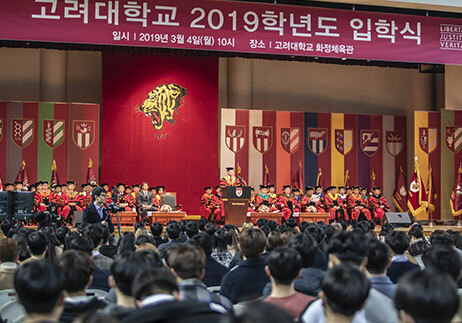 A video was played after the ceremony containing congratulatory messages from SeJung Oh (president of Seoul National University), YongHak Kim (president of Yonsei University), DohYeon Kim (president of POSTECH), and David Dolling (former dean of the School of Engineering at George Washington University). Newly appointed President Chung graduated from the Department of Mechanical Engineering at Korea University in 1983. He obtained his master’s degree from KU and doctoral degree in engineering from the University of Minnesota, USA. Before being elected as the 20th president of Korea University on December 20 last year, he had served as a professor in the Department of Mechanical Engineering, vice-president for Development and External Affairs, dean of the Graduate School of Engineering, dean of the College of Engineering, head director of Techno Complex, dean of the Graduate School of Management of Technology, president of the Korean Society for Fluid Machinery, and a member of the National Academy of Engineering of Korea.